← Bad actors and negligent experts in Crim Justice still immune. 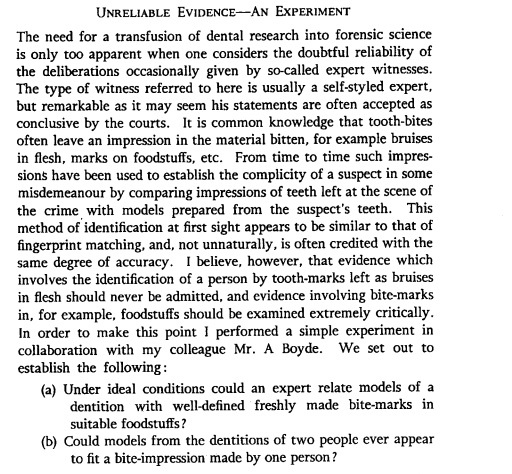 Forensics : 1960 When bitemarks were considered equal to fingerprints……..
………a British dentist said “bruises in human flesh” bitemarks were”unreliable evidence” and expressed reasons that were, 49 years later, used by the National Academy of Sciences in 2009 . He also said “usually a self-styled expert” and “so-called expert (s)” were involved in court deliberations touting their accuracy. Using those terms today, other than in your sleep, will get you sued or worse. In 2015, the co-director for research at the White House Office of Science and Technology Planning says their use for “matching” should be eradicated. This speaker, Dr. Jo Handlesman, is immune from charges of defamation and infliction of emotional distress. I hope. Full article on this “blast from the past” is at Professor Iain Pretty’s blog ‘Forensic Dentistry Online’ News. Below is an excerpt from the 1960 journal. Read the full 1960 journal paper from RW Fearnhead MDS. This entry was posted in AAFS, ABFO, Bite Marks, Bitemarks, CSI, expert testimony, forensic science reform and tagged American Academy of Forensic Science, AMERICAN BOARD OF FORENSIC ODONTOLOGY, bite marks, Bitemarks, CSI, Forensic science. Bookmark the permalink. 1 Response to Forensics : 1960 When bitemarks were considered equal to fingerprints……..
That was then, & this is now. I want to slam dunk those Odonts who have besmirched my reputation, by association! I will write a scientific treatise, pictorially representative of the “similarities” of our dentition, but I want Publishing rights.